Mac Outlook 2011 generated OLK14 files and Outlook 2016 generated OLK15 files Calendars and Mails converted to any version of Windows Outlook Data file i.e OLK to PST file. This PST file can later be imported in MS Outlook 2016, 2012, 2010, 2007 etc. This software supports the conversion of Mac Outlook Emails in two more formats. 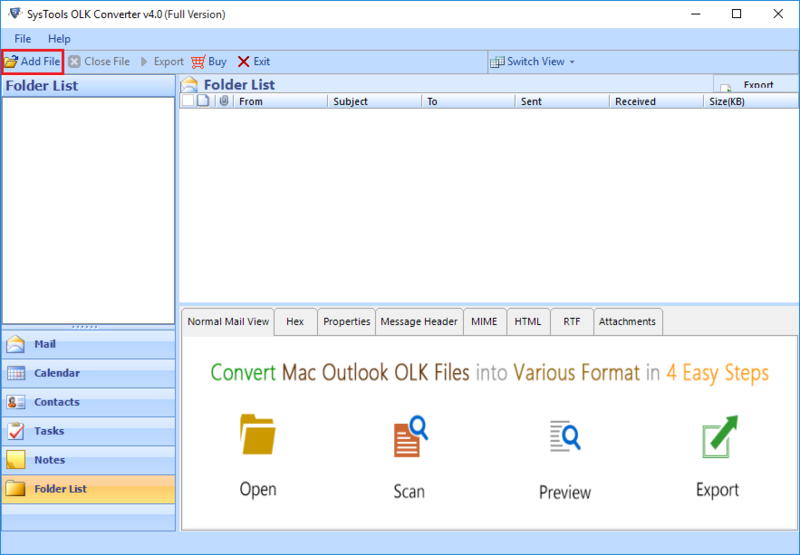 It converts Mac Outlook 2011 OLK14Message file to EML and MSG file format. By these conversion users can access Mac OLK file in different platforms like Windows Live Mail, Thunderbird, Outlook Express etc. This OLK Converter tool provides the option to apply date-based filters to each categories (Mails, Calendars). The conversion will take place only for the selected range of date. Choose the date To and From from calendar to select time interval. By using this facility user can save their time by filtering out unnecessary data. As Mac Outlook 2011 creates different OLK14Message file for each Mails received or sent in Outlook, so there may be thousands of OLK14Message file in Mac Outlook. So this software is able to convert these, multipleOLK files all at once, it has no limitation on number or size of OLK file. For OLK to EML and MSG conversion, software provides the multiple naming conventions in which the converted file can be saved. User can chose any style or pattern to save their file. File can be saved by subject, subject+date, autoincrement so that it is easily recognisable. The convert OLK14 tool allows the user to select the categories from Mails and Calendars. User can select any of the two desired categories for conversion. You can do this selective conversion in Advance settings of tool. Conversion of OLK14Message to PST, EML, MSG will take place only for selected items. Every applications maintains and store their database file of complete data of Account profile in backened at their default position. This database file consists of all mails, calendars, contacts and all the folders. 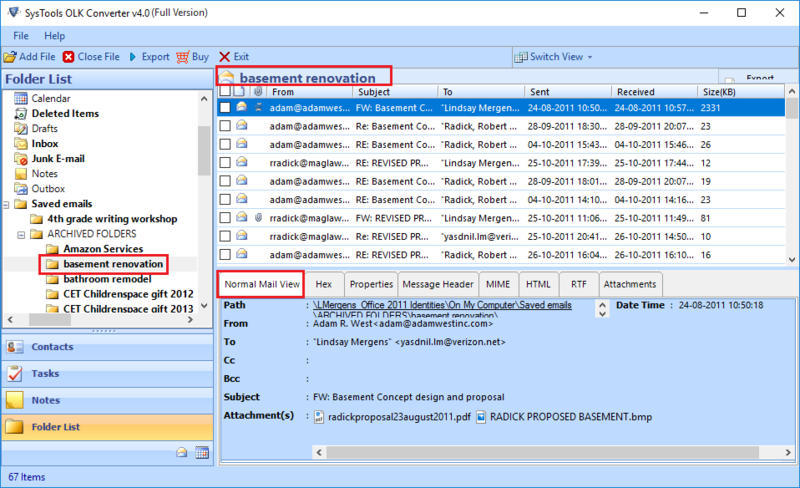 In Mac Outlook Temporary files of a profile is saved in OLK format, each items of Mac outlook 2011 is saved in olk14 and the extension changes according to items of Outlook. For each component of Mac Outlook it has different OLK14 format, for messages it is .olk14Message and for Calendars it is .olk14Event file extension. Different olk file is generated for each single messages and calendars. 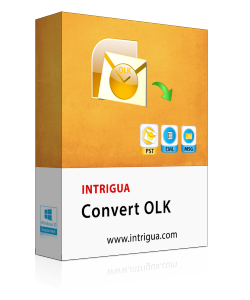 Intrigua convert olk is the utility for those user who wants to convert Mac Outlook 2011 mails i.e olk14Message files to PST file and migrate to Windows Outlook platform. OLK converter software converts bulk files at once. It let you access you Mac Outlook data outside the Mac environment without making any modification to the data. Step 1: Download, Install and Launch the Software. Step 2:Select the OLK file and Browse File. This video explains how to convert OLK14 files to Outlook PST file by using OLK14Message converter Tool. Can I convert OLK15Message file to PST and import it to Outlook 2016? Yes, OLK converter software is made to convert both OLK14Message file and OLK15Message file to PST file format. This PST can be imported to any versions of Window supported MS Outlook.. I have thousands of OLK14 files in Mac Outlook 2011. What is the limitation of tool to convert olk? No need to worry about the counts of olk files, there is no limitation on numbers of OLK files in conversion. 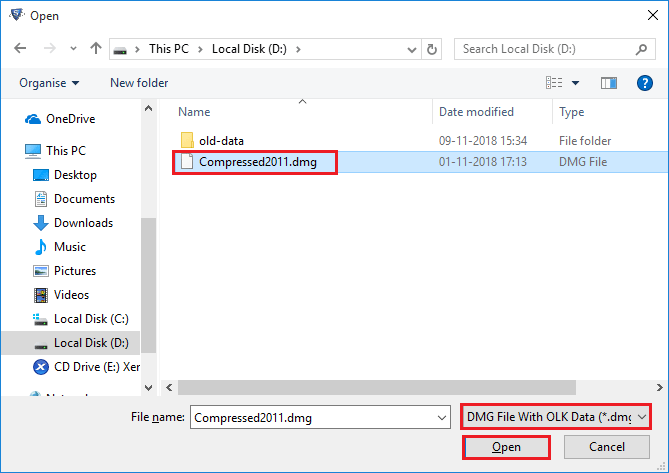 You can convert OLK files in bulk. Do the software import damaged or corrupted OLK file to PST? No, the application cannot convert damaged or corrupted OLK file. This converter tool can only import OLK 14message file to Outlook and other file formats. I was using Outlook 2015 in Mac OS. I had to share my emails with my company in Windows Outlook machine but I found that OLK15Message files cannot be open in Windows. I find my myself in trouble then I came to know about Intrigua Convert OLK software and recommended this to organisation to convert my OLK to PST. It was such a big relief using OLM converter tool. Few months before, I created my account in Outlook 2011 in my colleague Mac machine and continued to used his machine. But when I came to know that he has to shift in another city, I was worried that how would i access my data now. A friend recommended me to use Intrigua convert OLK tool which convert OLK to PST/EML/MSG and now I can easily move to any platform. I would like to say heartiest thanks to Development team of convert olk . OLK File Converter migrates Mac Outlook file consisting of emails, contacts, calendar etc to a different file format. 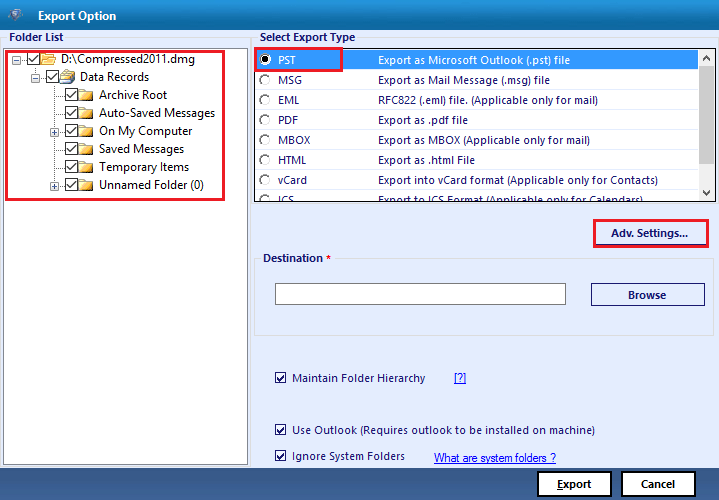 It extracts and exports entire Mac Outlook OLK to PST File with the facility to convert emails to EML & MSG format only. The software treats the OLK folder as the original source file to transfer olk14message. Multiple Mac OLK file can easily be migrated without any limitations. No restrictions are enforced for exporting various .olk14 / .olk15 files to other file formats. A user can perform bulk migration by utilizing “Add Folder” option to locate multiple OLK files easily. OLK Converter tool offers the facility to apply date filters in order to export particularly dated emails. This migration feature will save the trouble of manually selecting data files for conversion and saves Mac OLK to PST / MSG / EML file format. The user can mention the date period in “From” & “To” option to filter the messages among the browsed OLK files. Convert OLK Software allows a user to store converted OLK15Message / Olk14Message to the desired naming format. The user can store the data in his choice of the file name as the tool offers various file naming options like subject, subject+date etc for easy identification. The folder hierarchy of Mac OLK file is kept intact throughout the extraction procedure of olk14message files. No change and harm being done to the folder structure during OLK to PST file migration. The resultant PST / EML / MSG file consists of the same structure as that of original OLK. The tool consists of a user-friendly and interactive interface which makes it easy to convert OLK. Also, the layout of software is not complex and is very easy to understand. Moreover, the tool is compatible with latest Mac versions i.e OS X Yosemite 10.10.4 & 10.10.5 and OS Sierra 10.12.3 versions. Like every application, Outlook for Mac also stores its complete account profile data in back-end at their default location. Entire Mac Outlook items like mails, contacts, calendars etc are stored in the database files while temporary files of account profile are stored in OLK file. The OLK file maintains data individually for each profile. The items are saved in olk14 file with different file extensions like for messages olk14message file and for calendar olk14Event file extension is used. The tool is appropriate for those users who are in need to convert Mac Outlook olk14message and olk15message file to PST, EML, MSG file format. The reason of this conversion is that OLK files are not supported on in windows platform and to access them one need to export them in Windows Outlook format. 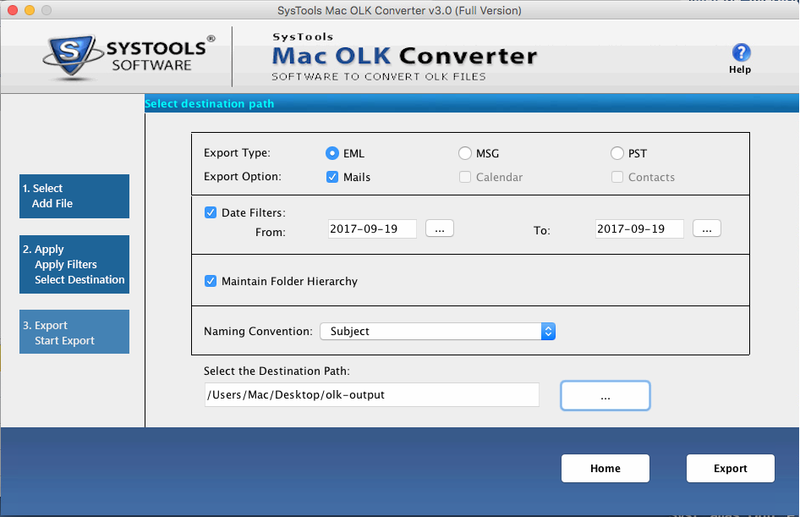 Intrigua’s OLK to PST converter software allows you convert OLK and also allow access of Mac Outlook Data outside the Mac environment without affecting the Quality of data. Step 1: Install and Open OLK14Message Converter tool. The Home screen of the software will appear. 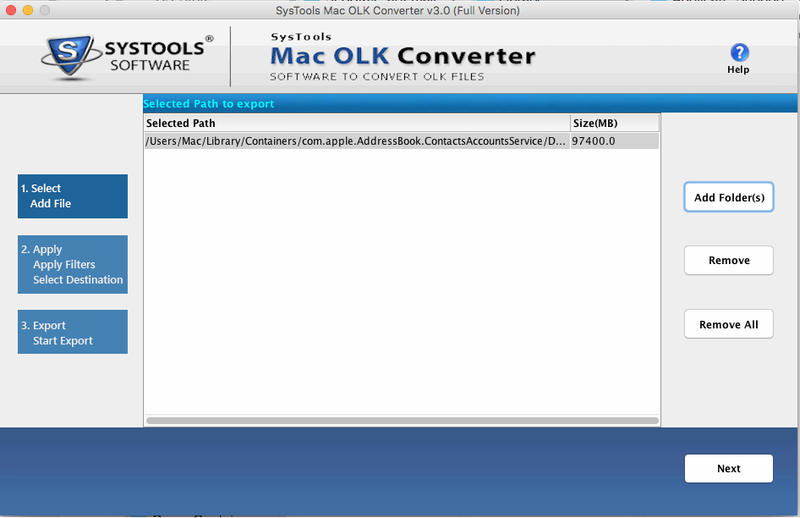 Step 2: Click on “Add File” button to select the source Mac OLK file to perform conversion. Step 3: Select the export option for .olk14 / .olk15 Outlook files with date filter option. Step 4: Status of migration can be viewed along with the item count while OLK to PST conversion procedure. The video depicts the complete software functionality for easy understanding of OLK to PST File conversion. I have some emails along with their attachment files that need to be converted. Can your software perform olk15 to EML migration along with attachments? Yes, our tool can easily perform the conversion of Mac Outlook olk15 file to EML along with its attachment file very easily. “Maintain Data Integrity” during the procedure, is our priority so no data is lost while conversion. Also you can perform OLK to MSG File migration very easily. In what way can I completely utilize the trial version of OLK file converter tool? Support multiple OLK14 / OLK15 file conversion simultaneously. Compatible with Mac OS X 10 and all above versions. Supports Mac OS X Yosemite Version 10.10.4 & 10.10.5, Mac OS Sierra Version 10.12.3, Mac OS X 10.10 and all above versions. Intrigua’s OLK to PST Software for Mac is the best conversion tool that I have encountered so far. Without any efforts, I was able to convert OLKmessage files to Windows Outlook PST. The tool worked perfectly on Mac OS X without any problem. It was a great experience working with this utility and a token of appreciation for the team who developed this application. I am currently working on Mac environment and was in need to export some historic OLK to PST Windows Outlook format. I was afraid to find an appropriate tool which will be compatible with Mac OS. But Intrigua OLK File Converter software really saved me the trouble of arranging a windows environment to perform the migration. Their tool did a wonderful job on Mac OS X version and gave me more than satisfactory results. Kudos! !